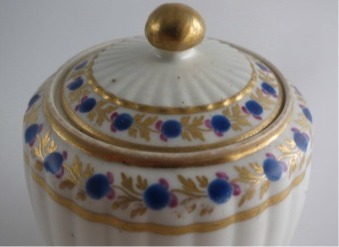 A most beautiful Caughley Tea Canister dating from c1790. 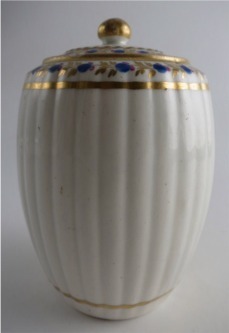 This elegant Tea Canister is of the 'New Fluted' moulded body design, this being the barrel shape with the vertical moulded lines, very fashionable at the end of the Eighteenth Century. 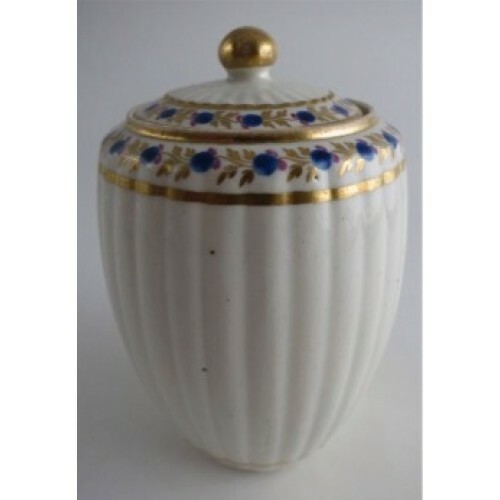 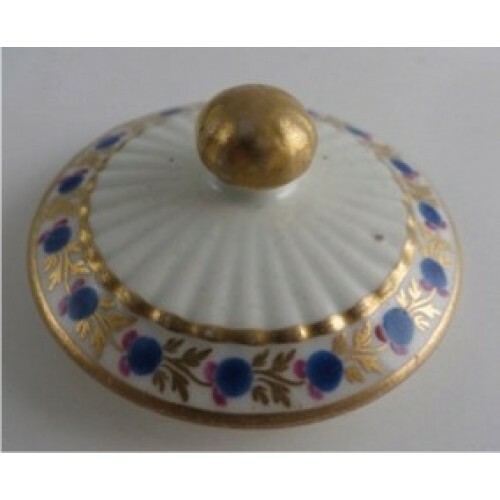 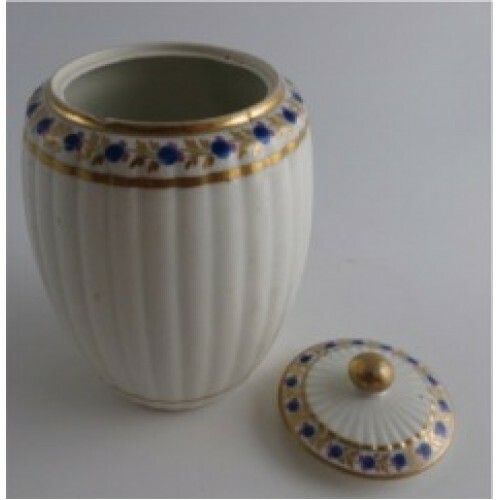 The Tea Canister is beautifully, but simply decorated around its shoulder and around the rim of the cover with an attractive stylised flower and foliage decorative bands. 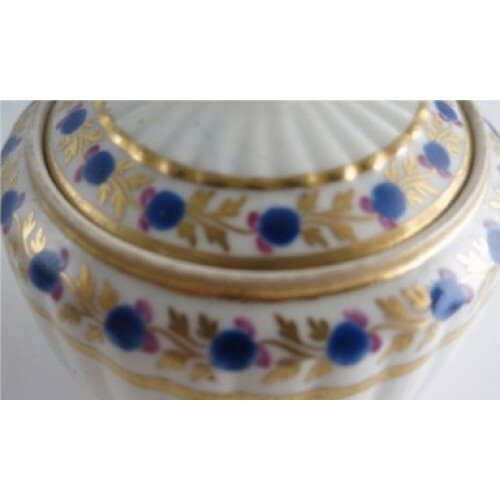 This decoration comprises small blue and pink flowers evenly spaced and joined together with fine honey coloured gilded foliage. 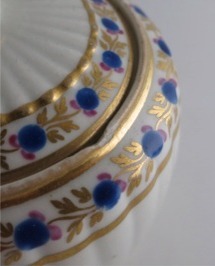 These bands of decoration are bounded by gilded lines. 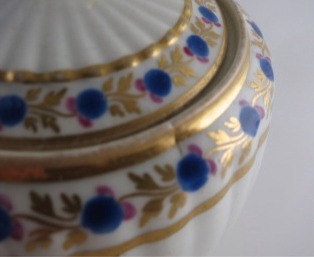 There is a further gilded line running round the body of the tea canister near to the base. 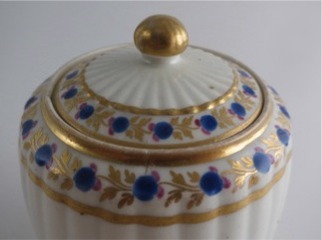 There is no manufacturer's mark on the Tea Canister, but this is a known Caughley design and type of body and dates from c1790. 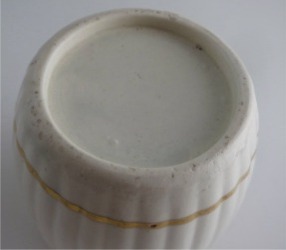 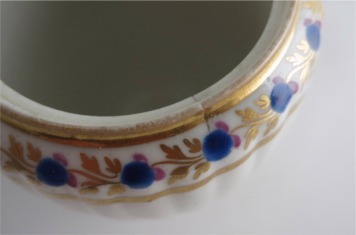 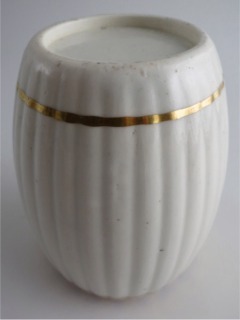 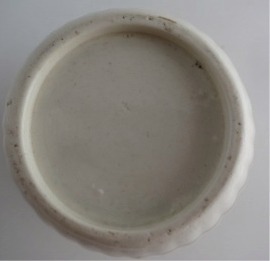 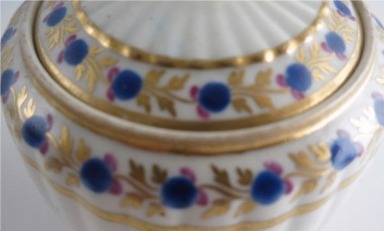 The cover is also fluted moulded, has the same decorative floral band around the rim as on the shoulder of the canister. 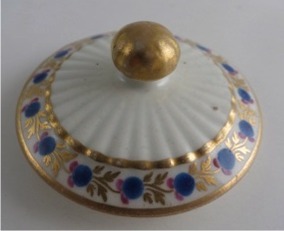 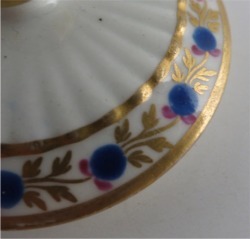 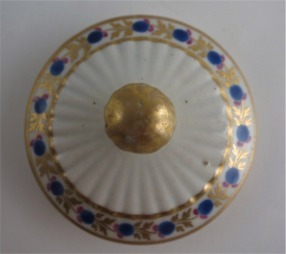 It also has the typical shaped Caughley button finial, which is gilded. 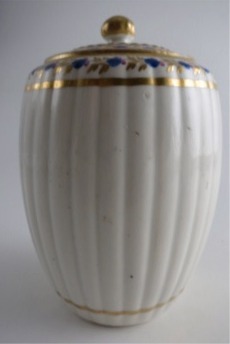 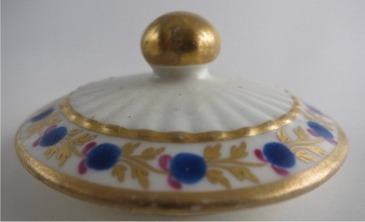 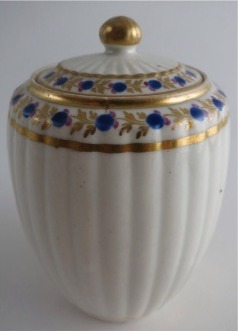 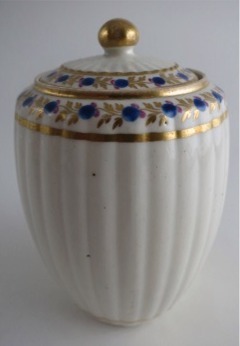 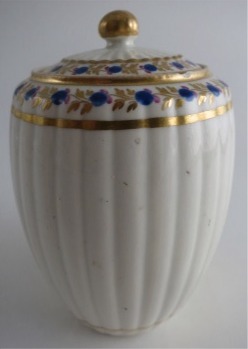 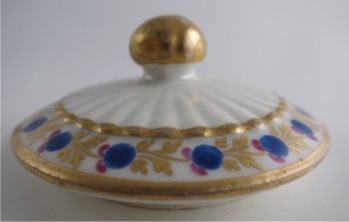 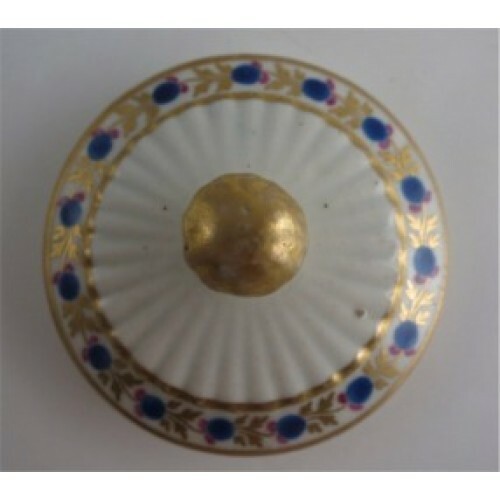 This delightful Tea Canister is generally in good condition, the decoration and gilding show very little sign of wear. 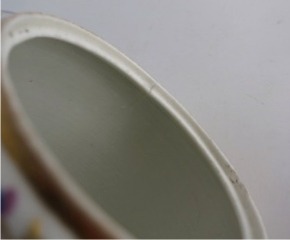 The only really minor imperfection is a tiny chip on the rim flange of the canister as shown in the first picture below. 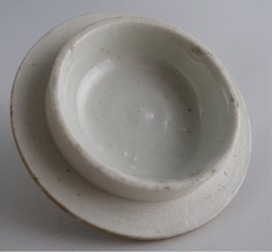 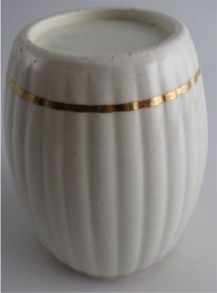 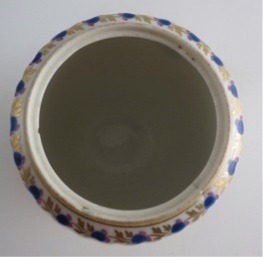 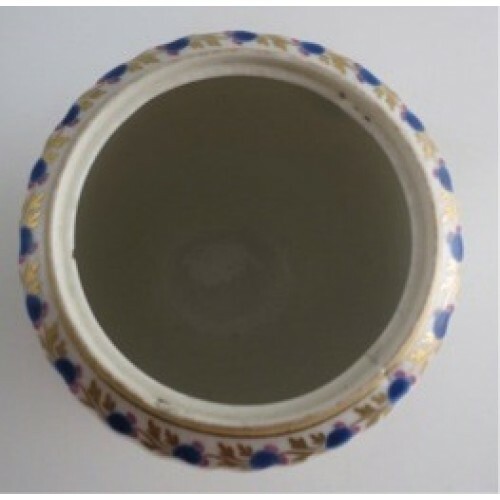 There is also a small chip on the raised rim of the canister and a short hairline crack from the rim down about 10mm inside the canister, not really visible from the outside body, shown in the pictures below, but it is small and does not really detract from this lovely tea canister. 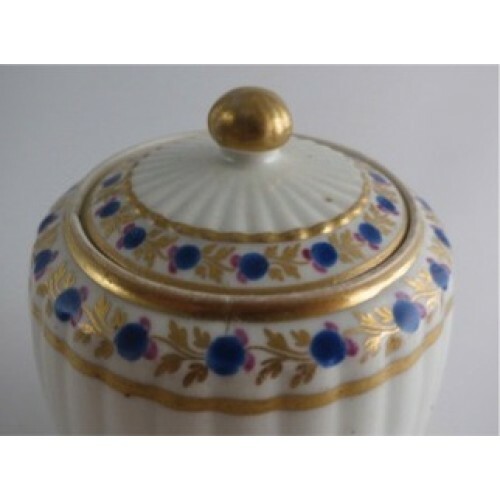 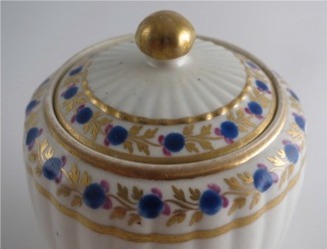 Description A most beautiful Caughley Tea Canister dating from c1790. 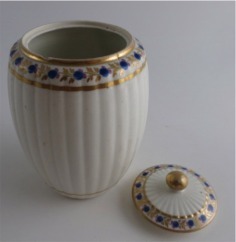 This elegant Tea Canister is of the 'New Fluted' moulded body design, this being the barrel shape with the vertical moulded lines, very fashionable at the end of the Eighteenth Century. 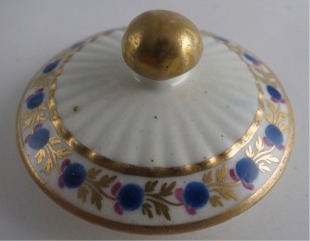 Condition (See main description for full details and pictures) This delightful Tea Canister is generally in good condition, the decoration and gilding show very little sign of wear. 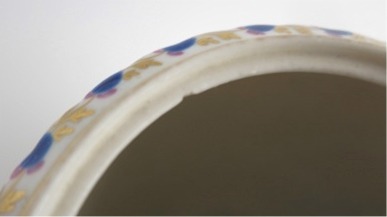 The only really minor imperfection is a tiny chip on the rim flange of the canister as shown in the main description.